A mansion that has become known as “Putin’s Black Sea Palace” has apparently been sold by its owner, Nikolai Shamalov, to businessman Aleksandr Ponomarenko in the capacity of a hotel complex, Kasparov.ru reports. The website cites the newspaper Kommersant, which Ponomarenko spoke to about the sale. The businessman said his holding company had obtained two companies – Lazurnaya Yagoda and Idokopas – that control the incomplete palatial complex. A source knowledgeable about the deal said it was worth 350 million USD. Kommersant was unable to reach Shamalov, a personal friend of Prime Minister Vladimir Putin and the owner Ponomarenko said agreed to sell him the property. Businessman Sergei Kolesnikov, who first alleged the palace was being built with public money for Putin’s personal use, said the transfer of ownership is only a disguise and the intended purpose of the complex hasn’t changed. Putin’s press secretary Dmitri Peskov told Kommersant the prime minister had nothing to do with the construction – not while he was president and not in his current position. 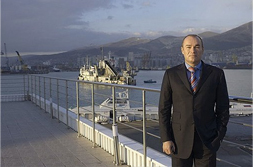 For his part, Ponomarenko said he was simply investing money obtained from his $2 billion sale of the Novorossiysk Commercial Sea Port last year. The article did not elaborate on what exactly was meant by the fact that the complex had been sold as a hotel. Whatever hang-changing the Black Sea palace may go through, strong evidence remains that Putin is somehow involved. Besides the evidence laid out in Kolesnikov’s open letter to President Dmitri Medvedev at the end of last year, documents have emerged showing that Chief Vladimir Kozhin of the Office of Presidential Affairs actually signed the documents authorizing the construction in 2005, when Putin was still president.